If you’re new to Google+, you’re probably excited to start uploading some photos from your computer to Google+. There are many ways to upload photos on Google+. The procedure that follows applies to just the photos page in Google+ and how you can upload photos there. 1. Click the Photos button on your main Google+ page. Click the Upload New Photos button in the upper right corner of the photos page. A pop-up dialog box appears, prompting you to start uploading photos (see the following figure). 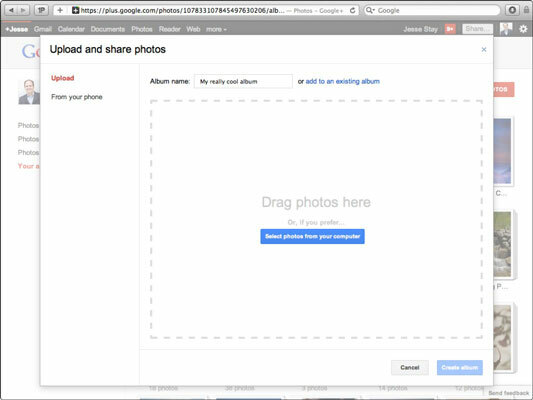 Uploading a photo or video in Google+. You are prompted to select the files from your computer’s hard drive that you would like to upload to Google+. Choose the photos or videos on your hard drive you want to upload. You can do this in the text input box at the top of the Upload and share photos dialog box. Click the Create Album button. An album will be created with the name you selected and you’ll be prompted to share with your circles. Select the circles you want to share with, add a comment, and you’re done.